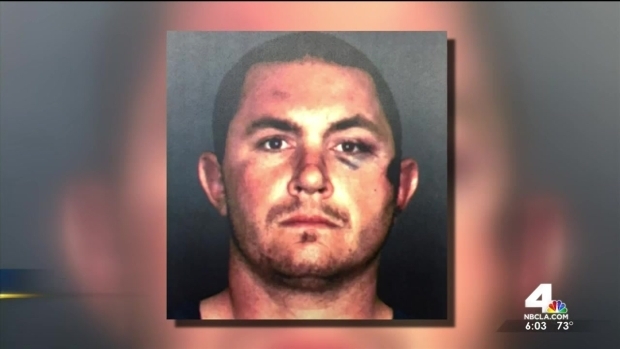 A man beaten by sheriff's deputies during an arrest after a horseback pursuit in the high desert northeast of Los Angeles said he feared for his life and struggled for air as deputies repeatedly stunned him with Tasers and delivered a barrage of kicks and punches. Francis Jared Pusok, 30, of Apple Valley, spoke on Monday to NBC4 about his arrest that prompted an internal investigation into San Bernardino County deputies' actions and a federal civil rights probe. Ten deputies have been placed on paid administrative leave after the arrest, captured on camera Thursday by NewsChopper4. "I thought I was being beaten to death," said Pusok, who suffered wounds to his head, ribs, back, face, neck and legs. "I was wondering, 'When is it going to stop?'" Deputies beat Pusok after he led deputies on a nearly three-hour pursuit that began when authorities were trying to serve a warrant in connection with an identity theft investigation that his attorney said he had nothing to do with. Pusok said he complied with deputies' orders to put his hands behind his back after he fell off the horse. He said deputies cuffed both his hands and ankles. He then expected to be questioned, he said, but "they just beat me" instead. He said he was stunned several times with Tasers and deputies pressed his head into the sand as he fought for air. "They tased me again after they hit me for awhile," he said. Afterward, he said one of the deputies who beat him walked up and whispered in his ear, "This isn't over." Sheriff's officials declined to comment about Pusok's allegations, citing the ongoing investigation, but earlier Sheriff John McMahon said the video of the arrest appeared excessive. "I assure you that if there's any criminal wrongdoing on the part of any of our deputy sheriffs or any policy violations, we will take action," he said. The girlfriend of a man who was punched and kicked by sheriff’s deputies during his arrest said she felt anger and fear after hearing his account of the incident. Jane Yamamoto reports for the NBC4 News at 5 and 6 p.m. on Sunday, April 12, 2015. Pusok was hospitalized and jailed on charges of felony evading, theft of a horse, and possession of stolen property. He was released from custody on Sunday after posting bail. San Bernardino Superior Court records show Pusok has convictions for resisting arrest, animal cruelty, disturbing the peace, attempted robbery and failure to provide evidence of financial responsibility.